Come on, just admit it; there’s a little stalker in you that’s eager to find out “a little more” , isn’t there? Well, Facebook has been trying to feed that little stalker in you and help you with your “inquiries” with its Graph search that has been rolled our back in January. With that new enhancement, a selected number of users have been able to gauge a more precise search between Facebook’s huge amount of images, people as well as connections that CEO Mark Zuckerberg claims is by no means a “web search”. Rather than the latter, this new tool will be aimed to find specific pieces of content from an exact query, rather than web search which usually returns general responses. Using a sort of a tagging system, the Graph Search uses a series of filters that allows sorting things like relationships, interests as well as location. Regular searches will be handled by a new partnership with Bing. The idea is to provide the users with information that is both popular and relevant to the users’ query. Facebook suggests things like “Friends who like How I met your mother and Game of thrones” which makes planning a movie night that bit easier or finding that someone you’ve met at a party through the mutual friends that attended the same event. To some extent, Facebook is also acquiring review sites such as the likes of Yelp with a new Places search of their own. Some of the filters will grant the users the ability to look up “Dentists in California” and thus find results that are liked by friends, accompanied by addresses and phone numbers. This will be a new way to integrate social reviews while providing the users with results from their actual friends or family, instead of strangers or obscure acquaintances. The company is aiming to pitch this new Graph Search as an alternative to the more business-oriented networks such as LinkedIn. 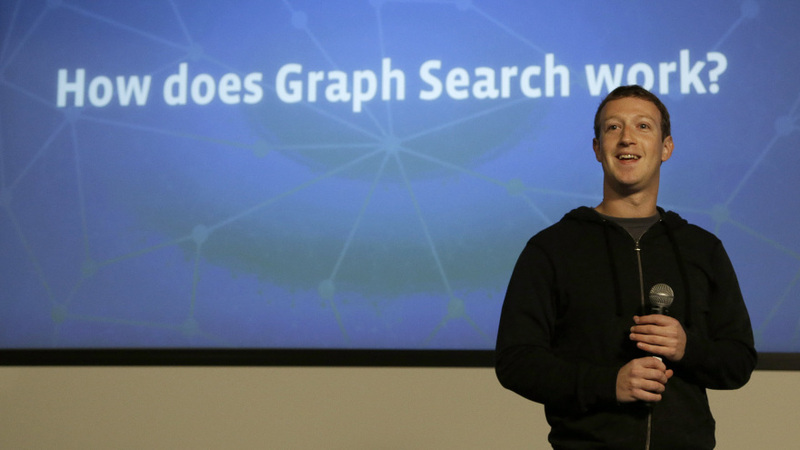 Facebook, in a promo to journalists, explained how the Graph Search will be an easier way to track down individuals that work at a certain company – a customary practice for LinkedIn – while providing the benefits that come along with the insight into their personal interests. The Graph Search was only available randomly for a certain number of users. Today, it will come to people in the US as well as other that use the Facebook website in American English. The roll out will reportedly need a couple of weeks to reach all of those, and there is no confirmed information about when the feature might come to other countries and languages. The Graph Search currently only works on the full Facebook website – it’s unclear when a mobile version will be out-.